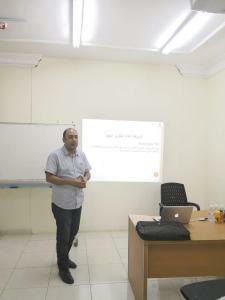 On Tuesday 6 November, 2018, the College of Engineering in Al-Leith held a workshop for engineers entitled 'Reports and Articles Structures'. The workshop was presented by the College Vice-Dean for Educational Affairs, Dr. Walid Al-Shishtawi. 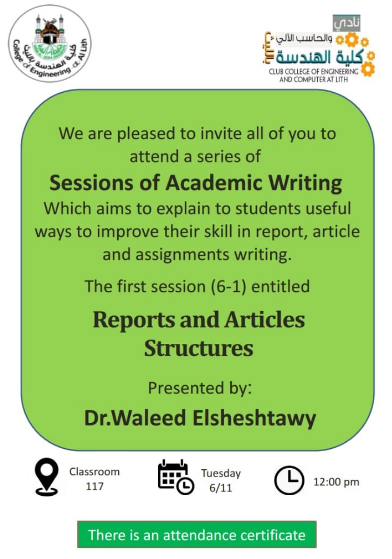 This workshop is the first in a series of workshops aimed at providing the students of the College of Engineering with the skills needed for writing technical reports, and the use of software in formatting articles and reports. The workshops also aim at providing the students with effective presentation skills, and information on how to write a curriculum vitae.